I ran today. The first time since last Sunday’s run. The first time in a week. Just as Jack was every ounce of sailor, last Sunday’s run was every ounce of effort. I had an extremely busy week so not only did I not have opportunity to run, I did not find time to finish the blog entry I began of last Sunday’s slogging. Suffice it to say it was 7 kilometres of challenging mind training. This morning I slept late. It was luxurious and I awoke inside the spoon. Following a lengthy session of synchronized spooning – you know, spoonstretchrollspoon set on automatic repeat – I checked the weather, pulled on some gear, tried to clear some of the nasal and chest congestion I felt upon waking and headed out the door. At 7:00am the sun was already riding the hip of the horizon and the air was cool, fresh and palpably alive. The heavy dew sketched webs in the grass and lay like layers of pale pink tulle over the tops of marsh grasses. I set off east this morning, turning into the sun at the end of my lane, with the intention of a short run in deference to my congestion. In this direction I start on a downgrade and therefore end the run on an upgrade. There are more homes and fewer farm fields to my east and the possibility of more traffic, though it was minimal this morning. The small dense wooded areas between the highway and the river provided heavy shade, with glimpses of sunlight. My feet felt great on the pavement and I marveled at the total sweetness of this run compared to last week’s. My hands, loose and nonchalant, stayed cool throughout the run and my ankles, knees and hips were in a flow of almost effortlessness. Not a twinge of any sort to command my loving compassionate awareness. This was a time to breathe and be. Listening to my foot falls, imagining them soft and quiet and thinking of picking up each foot rather than pushing off. Squirrels chastened me, chittering cheekily from unseen tree limbs and the birds, unplugged, provided inspirational melody. Today the roadsides are an amazing array of flora. Morning glories – what an apt name – bursting into pale blue five pointed stars amid a confusion of crown vetch. Dignified clusters of Queen Anne’s Lace unaffected by the showy, somewhat pretentious stands of purple loosestrife. Scatterlings of susans. Galores of goldenrod. Calamities of cat tails. Clover, common sorrel, tiny eyebright. 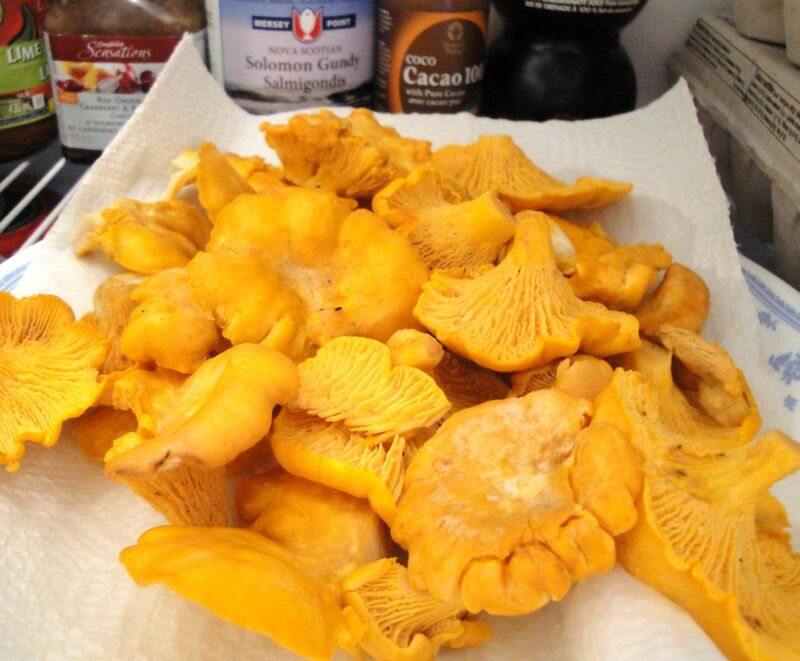 Ditches of low wild blueberry bushes and a pale orange cache of chanterelles. The upgrade home had me breathing heavy, a press in my chest of a bout of bronchitis which has been waltzing me on occasion, patiently awaiting a full dance card. I sip Chrysanthemum Nest tea as I write this, but only after slipping back to pick more than a taste of chanterelles. P.S. We are hoping they are chanterelles. I am a Health & Fitness Specialist and I am just leaping in to the next part of my life -- a Fitness Studio! I hope my adventure intersects with your adventure. This entry was posted in Barefoot running, Short Runs, zen running and tagged barefoot, chanterelles, flora. Bookmark the permalink. I’m happy you had a good run Wendy, especially after having a difficult one. Serves to inspire. Thank you for reminding me to never let go of the enjoyment. Thanks Christine. It is always just our best foot forward, isn’t it? They are chanterelles! I have them in the forest behind my house! What a beautifully written post – you’re so aware on your runs. It’s an inspiration! Well, we ate them and I am still running so you are absolutely right! Thanks for the feedback Jen. Your energy and running creativity is also an inspiration!